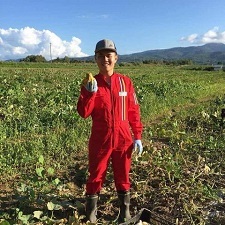 Yanru Wu, who studied Japanese and graduated in 2015, is currently working as a JET (Japan Exchange and Teaching fellow) in the Niseko Town Office, Hokkaido. Niseko is famous for tourism and agriculture. You can see more photos of Yanru enjoying various activities in Niseko here . Ryan Buyco, currently a PhD candidate at Cornell University, recently received the Fulbright-Hays Doctoral Dissertation Research Abroad fellowship. Read more here. The Japanese Language and Literature Program offers undergraduates a major and a minor in Japanese. A full course listing is available on the GW Bulletin. The general requirements of the Columbian College of Arts and Sciences. Prerequisite courses: JAPN 1001-2, 2003-4, or equivalent. 18 additional credit hours of upper level Japanese courses. 6 credit hours in related upper level courses outside the program, as approved by the program advisor. A requirement worksheet is provided. Mid-Atlantic Association of Teachers of Japanese is collecting inspirational stories from professionals who have studied Japanese. To check out the current collection or share your story, visit here and follow "Advocacy Project" to "Project J.Life." Professor Tsujioka's class and her students as well as Professor Hamano's old student are featured in this promotional video created by ACTFL. Students of Walt Whitman High School visited Professor Tsujioka's JAPN 2003 class, accompanied by their teacher, Ms. Yukiyo Moorman. A Japanese major, Xavier Brodnax, was one of the 42 college students in the Washington D.C. region who attended the TOMODACHI Daiwa House Student Leadership Conference III from October 20-23, 2016. The conference is a unique leadership development opportunity designed to mentor and nurture future leaders in the United States and Japan.